3 Is Kurilpa Bridge a Tensegrity Structure? Kurilpa bridge is a pedestrian bridge that links Brisbane’s central business district with the newly developed arts and cultural precinct on the city’s South Bank. Inspired by the concept of tensegrity—a modern art form and structural system—the multi-mast, cable-stay structure is 470 meters long and features two large viewing and relaxation platforms, two rest areas, and a continuous all-weather canopy for the entire length of the bridge. Ken Enright, Senior Design Technician at Arup, said the bridge cost AU$63 million . The design team modeled the tensegrity superstructure in GenerativeComponents while the bridge centerline geometry was being finalized in MX. Horizontal and vertical alignments were balanced against disability access requirements and approach structure clearances. 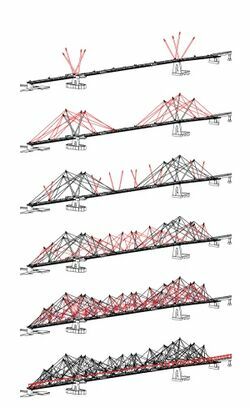 To find a clash-free solution for superstructure geometry, the team--Rayner Architects] with the engineers []--dynamically adjusted the model using GenerativeComponents and Bentley Structural. Construction was led by Baulderstone Hornibrook contractors and [Steel Fabricators]. Baulderstone won the Engineers’ Australia 2010 Engineering Excellence Award for its work on the bridge and in cooperation with the Department of Public Works, Arup and Cox Rayner. Kurilpa Bridge Designed by Cox Rayner Architects. 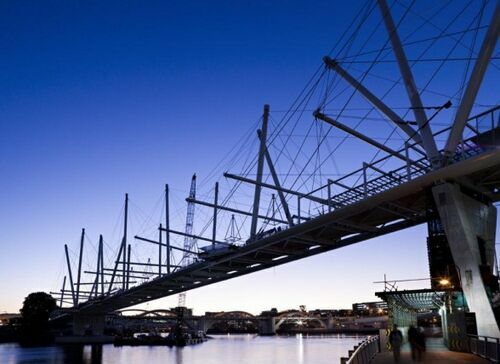 Is Kurilpa Bridge a Tensegrity Structure? A blogger on bridges, The Happy Pontist, [], critiqued the Kurilpa Bridge here http://happypontist.blogspot.com/2009/06/tensegrity-bridges-4-kurilpa-bridge.html and here http://happypontist.blogspot.com/2009/10/kurilpa-bridge-opens.html. The Pontilist states that the bridge is not a pure tensegrity. "The bridge deck is a continuous member carrying both bending and axial compression, and is stiffened laterally with what appears to be conventional bracing. There are several locations where struts interconnect... most obviously over the piers, which support the conjunction of two mast struts as well as the compression strut of the deck." The pontilist concludes that Kurilpa Bridge is basically a [bridge] with some aspects of an inverted fink truss (see his blog, [] or [Victoria Dock] Bridge, for examples). The Pontilist states that these modifications of the cable-stay and inverted fink truss make the bridge very expensive. "Built for AUS$20m, I estimate it cost about £3,500 per square metre of deck, which is extremely good value for a large-span landmark footbridge... Kurilpa Bridge is... one of the most expensive fixed footbridges ever built. Guessing it to be twice as long overall as its 128m main span, and of similar width to its cousin, I reckon it cost £19,000 per square metre." The bridge is relatively light, but has a comparatively long main span and a complex array of masts and cables. All this plus its unique design meant that it could be subject to unusual dynamic or aerodynamic effects with no precedents or “rules-of-thumb” upon which to draw. As a result, extensive wind tunnel, dynamic and fatigue analyses were required to comprehensively investigate and resolve all potential dynamic phenomena. It suspends the canopy, allowing it to float above the deck with no apparent means of support. It laterally restrains the tops of all the masts, preventing them from buckling sideways under the loads arising from the suspension of the deck plus lateral and seismic forces. Kurilpa construction in layers by Oasys Software.